War has a way of changing peoples’ lives in an instant, most often tragically. But its lessons can linger for a lifetime and contribute something good to the world. Such is the case for retired Rockford dentist Allen Pang. Until Dec. 7, 1941, he was a carefree college sophomore at the University of Hawaii in his hometown of Honolulu. He had little focus or career ambition; making a difference in the world wasn’t something he thought about. Born an American citizen with Chinese ancestry in 1920s Hawaii Territory, young Pang chased the “rice birds” away from his grandfather’s verdant fields, to keep them from gobbling up the ripening grain. As a teenager he earned 35 cents per hour working at a Dole pineapple plant. It was a peaceful existence spent with family and friends, many of the latter having Japanese ancestry. Hawaii was about 40 percent Japanese, at the time, and wouldn’t become a state until 1959. Then, early on a Sunday morning – Dec. 7, 1941 – as he lay in bed in his family home, Pang awakened to the sound of gunfire. Pang and other senior ROTC students immediately volunteered for duty. Pang guarded an ammunition site just outside of Pearl Harbor for the next 12 months. He recalls living under a curfew, but says life outside the bombing site was otherwise pretty normal, with one exception. It felt odd to see his lifelong friends rounded up, says Pang. In December 1942, Pang applied for aviation cadet training and shipped out to Santa Anna, Calif.
“At that time, air cadets were part of the U.S. Army Air Forces,” Pang explains. “After the war ended, Gen. Henry ‘Hap’ Arnold [who was taught to fly by the Wright Brothers] lobbied Congress to form a separate service branch which became the United States Air Force.” During Pang’s years of service, Gen. Arnold grew the U.S. Army Air Forces from 22,000 officers to a whopping 2.5 million men and women. Pang’s year of air cadet training took him to many locations throughout the U.S., where he learned not only the complicated algebraic skills required of a bombardier navigator, but also skills such as camouflaging, Morse Code, emergency responses, weapons training and much more. “We had a whole class on learning to fold maps the right way,” he chuckles. Fumbling with a map was no laughing matter when bomb runs were measured in seconds and done without computers. A flak map, for example, not only showed the geographic location of bomb targets but also the sites where 8.8 cm flak guns (“88s”) were likely to fire at your aircraft from the ground. Another crucial skill was the ability to identify shapes at lightning speed. Pang first trained with a unit flying Douglas A-20 airplanes. “But at that time, during World War II, no Asians were allowed to serve in the Pacific Theater, which is where my A-20 outfit was headed,” says Pang. “So that’s when I was separated out and put into a B-26 school.” He looks back on this as a stroke of good luck, since casualties were higher in the Pacific Theater than Europe. Still, it was bittersweet to separate from chums with whom he had trained. Pang became part of a Martin B-26 Marauder crew, with the rank of Second Lieutenant. This mid-sized, twin-engine bomber earned the nicknames “widowmaker” and “the flying prostitute” soon after it began service in 1942. After 15 crashes within 30 days at MacDill Field in Florida, the catchphrase “One a day in Tampa Bay” only enlarged its fearsome reputation. But the problem was more about pilots than the plane, says Pang. Because of its relatively short wingspan, the Marauder had a high accident rate during takeoffs and landings because it had to be flown at precise airspeeds. The 120 to 135 mph speed it required on a short final runway approach intimidated novice pilots accustomed to much slower speeds in other planes. When they ignored the plane’s specs and slowed down too much, the plane stalled and crashed. A Marauder crew usually consisted of three officers – pilot, co-pilot and bombardier/navigator – and three gunners. As bombardier/navigator, Pang sat in the transparent nose of the aircraft. 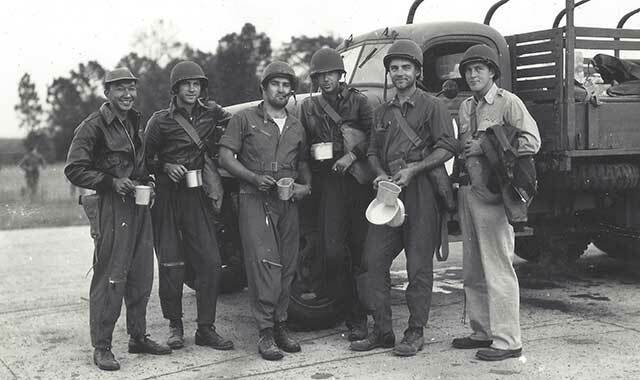 Pang (left) with fellow crewmen Davidson, Pryor, Sullivan, Knapp and Aamodt. Sullivan was killed. Pryor and Davidson died after being shot down during their 85th mission. After they completed training, Pang’s crew picked up a Marauder from Savanna, Ga., and flew it to Telergma, Algeria, via a South American route over Puerto Rico, British Guiana and Brazil. They refueled on Ascension Island. “Because it was a smaller plane, it couldn’t get all the way across the Atlantic Ocean,” Pang explains. From Ascension Island they flew to Liberia and up the west coast of Africa to Telergma, where they joined the illustrious 17th Bomb Group. This bomb group enjoyed celebrity, before Pang arrived, because of its role in Doolittle’s Raid of April 1942 – the first U.S. bombing mission of the war carried out in Japan. Led by Lt. Col. James Doolittle, 16 daring B-25B Mitchell medium bomber crews hit Tokyo and other targets across Japan, knowing full well it was impossible to return to the USS Hornet Aircraft Carrier from which they had launched. All of the aircraft were lost during the raid, most crashing in China. Remarkably, 14 of 16 crews (minus one man) returned safely to friendly territory. And Pang would see plenty of action of his own. As the enemy retreated from North Africa – Pang will never forget how cold the desert was there at night – his crew moved north to Sardinia, Italy, where it conducted bombing missions on southern Italy. Before each mission, Pang and crew attended a briefing. A bomb run is the portion of the mission in which the target is spotted and the bombs are released. It requires great precision to be successful, since the planes travel in a close-knit group, straight and level, and the bombardier’s computations depend upon consistency. “The plane next to you might be just 6 feet away,” Pang recalls. Pang sometimes used photos taken by military photographers on previous missions to identify a target. On most missions, the plane carried six large bombs suitable for blowing up structures like bridges. When the target was people, however, larger numbers of smaller fragmentary bombs were used. The Marauders flew six planes to a squadron. About four squadrons went out together. By closely grouping together, they enhanced the firepower they could unleash on approaching enemy planes. But this also made the Marauders a larger target. So when the enemy began firing from the ground, the Marauders spread out and took evasive action. The planes were most vulnerable during the actual bomb run because they needed to maintain consistent speed and altitude, something the enemy well knew. The clink-clink-clink sound of flak hitting his plane is a sound Pang has never forgotten. By contrast, Pang’s crew slept close to the front in tents or under the wings of their planes, in remote posts like Sardinia, Italy. Being entrepreneurial Americans, they made the best of it. Pang recalls that he and his co-pilot friend Simpson didn’t smoke, so they stored up their ration of cigarettes and traded them for labor and materials to build a small brick house. “We stayed in Sardinia four or five months,” Pang recalls. He also remembers that there was no running water, no bathtub, no shower. From a canvas lister bag they shared, the men poured water into their helmets each morning to wash up. “Once in awhile we were able to bum a ride to a river a few miles away, where we could clean ourselves up,” Pang adds. They also rode to a primitive little community called Villacidro, where Italian-speaking villagers swapped fresh eggs and other treats in exchange for cigarettes. The fact that Italy was an Axis power until Mussolini died in July 1943 didn’t seem to matter much. Conditions were similar at their next post, French-run, Italian-speaking Corsica, from which they bombed parts of middle and northern Italy and southern France. Between missions, Pang and friends explored the countryside, played pingpong or read books. “And everywhere we went, we built an officers club,” the Second Lieutenant recalls with a smile. Although they were in remote areas, the Marauders occasionally made it to a USO performance or traveled to famous sites while on breaks, such as Napoleon’s home in Corsica. They purchased Cognac from Cognac, France, toured Cannes and visited historic landmarks throughout Italy and France. In all, Pang flew 68 missions, each averaging 4 to 5 hours in duration. “All of our missions were very short because we were stationed so close to the front,” he explains. During one mission to Rome, he came face-to-face with a German pilot in mid-air. “He was out of ammo and we were on our way home, so we didn’t do anything about it,” Pang recalls. Pang’s 61st mission, a training mission, fulfilled the requirements of a tour. That’s not why it stands out in his memory, though. It was during this mission out of Corsica that his plane’s hydraulic system failed, requiring the crew – there were only three men in the plane that day – to prepare for an emergency landing. Pang doesn’t recall being panicked by the incident – in fact he has no memory of being really scared at any time during the war. After Corsica, Pang’s crew moved to Dijon, France, running missions to bomb the Siegfried Line (West Wall) that divided France and Germany. That line ran nearly 390 miles, from the Netherlands south to Switzerland. Germans constructed the original network of bunkers, tunnels and tank traps during World War I and re-fortified it in the late 1930s. Upon completion of his tour, Pang was granted a six-month leave to Oahu. (Ironically, he was first required to take three weeks of “overseas training” on the Mainland before he could go home to the islands.) Pang was preparing for more combat duty when the war ended. His service had lasted from the day of the Pearl Harbor attack until September 1945, nearly the exact footprint of the war. He was awarded 13 Air Medals, several battle stars and the Presidential and French Croix de Guerre avec Palme unit citations. By war’s end, the unfocused kid from the University of Hawaii had become remarkably clear about his life ambitions. Pang graduated from the University of Iowa and then moved into a dental graduate program at Loyola University in Chicago. He then earned his postgraduate degree in pediatric dentistry from the University of Illinois. His time in Chicago proved fortuitous in more ways than one. When Allen called Kay’s roommate to ask for a date, the roomate sent Kay to meet him instead. “I wasn’t too impressed with him on that first date, but I gave him a second chance,” Kay recalls. This was in January. By springtime they were engaged. They married in September, renting a modest apartment across from Cook County Hospital as Allen finished his senior year of dental school. Their parents at first questioned the wisdom of their engagement. “Not only was Allen of Chinese ancestry, but we were considered an interracial marriage, which was still illegal in some states back then,” recalls Kay, whose ancestors were German-American. “We’ve been married for 67 years,” Allen adds, smiling. After graduation, the couple moved to Honolulu, where Allen fulfilled his pediatric dentistry internship and Kay planned to work at Queens Hospital in Honolulu. Instead, she gave birth to the first of their four children. Hawaii was OK, but Kay missed the change of seasons in her native Midwest. She began to worry her family wouldn’t get to know their children. So the couple moved back to the Midwest, where Allen hooked up with a Chicago dental equipment company that introduced him to a group of dentists in Rockford. Sadly, Rockford didn’t return Allen Pang’s warmth, at first. This U.S. veteran who had braved 68 combat missions for his country was met with suspicion by a handful of dentists who suggested Pang, with his Asian appearance, should instead “try that city 50 miles down the road.” It’s a phrase he’s never forgotten. “That was my very first reception in Rockford, but I decided to stay anyway,” recalls Pang. A few days later he brought Kay to Rockford to house hunt. “The realtors told us, ‘You’d be happier someplace else,’” Kay recalls. “Allen had confidence that, once he was able to begin his practice, he would be accepted, and that’s what happened,” says Kay. Pang opened his practice in 1951 and it immediately thrived. “Right after we moved here, we became very active in the community,” Kay recalls. “I met some nice people and got involved with several groups, including the Rockford Woman’s Club.” She also joined the Rockford Garden Club. In the seven decades since, the Pangs have served on dozens of boards and committees for Rockford service clubs and charities, often in leadership roles. Pang was an early board member for Rosecrance, Klehm Arboretum, Severson Dells and University Club. He led the committee that built Christ United Methodist Church. He was the first Asian to be elected Potentate of the Shrine Temple and was awarded the Forrest Riordan Distinguished Humanitarian Award for Excellence in Medical Service in 2006. Somehow, the Pangs also found time to own a dairy farm in Belvidere and 60 apartments in DeKalb. Pang enjoyed pediatric dentistry immensely. In 1965, he and Bob Sechler, then a Rock Valley College trustee, established a dental assistant’s training program. The Journal of the American Dental Association published an article Pang wrote about “Musical Wind Instruments for Malocclusion” after Pang’s patients found that playing certain instruments improved their dental conditions. Even after his retirement in 1989, Pang volunteered his services. In 2010, the Winnebago County Dental Society awarded him with the Dr. Scott Erickson Memorial Caring Award after he volunteered at Crusader Community Health on Broadway Street for five years, charging an annual salary of $1 per year. Four years later, he was the first dentist to be presented with Crusader’s Spirit of Caring Award; he currently serves on the board of directors of Crusader Community Health Foundation. He’s a Paul Harris Fellow in the Rockford Rotary Club and was presented with the Cosmopolitan Club Distinguished Service Award. Through his involvement with the University of Iowa, Pang helped recruit renowned football coaches Bob Commings and Hayden Fry, as well as basketball coach Lute Olson. The Pangs have made many trips to Hawaii; they’ve avidly fished, golfed, gardened and volunteered. In 1979, Pang was named the Dental Society Golf and Gin Rummy champion. 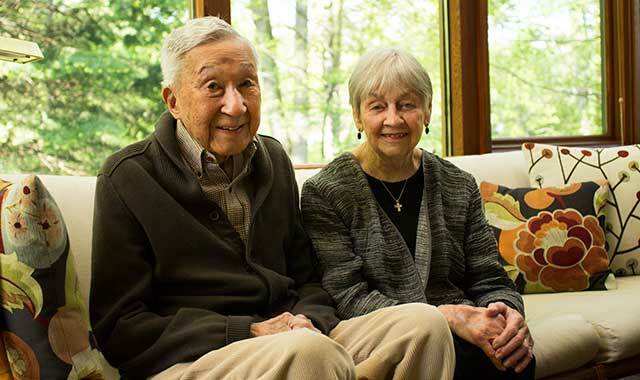 The couple lives in a serenely beautiful home they designed themselves 60 years ago; it’s tucked into a Rockford woods and the Pangs registered their yard as a wildlife habitat long before the art of landscaping with native plants was en vogue. “We have no regrets about choosing Rockford as our home. We love Rockford,” says Pang. “Our kids loved growing up in Rockford and didn’t have any problem being accepted here,” says Kay. Each grew up to be a successful professional. Daughter Sarah Pang Munies spent nine years as deputy chief of staff for Mayor Richard M. Daley in Chicago and is now senior vice president for CNA’s corporate communications department; daughter Laura Pang Wheeler is the principal of a Houston high school; daughter Susan Pang Hughes enjoys a career with the YMCA in Minnesota. Tragically, the Pangs lost their only son, Steven Pang, a banker at Alpine Bank, to ALS seven years ago. “I know I was very lucky I never got hurt or killed, but in some ways the war saved me,” says Pang. In the military he developed skills and confidence, traveled the world, found his life’s focus and the courage to pursue it. He’d always enjoyed people, but wasn’t exposed to their diversity until he shared cramped quarters with men from all parts of the U.S. during training. They often welcomed Allen into their homes during holidays and summer breaks, since Honolulu was so far away. Pang has been called “the last veteran of Pearl Harbor” in our region. “I don’t know if that’s true or not,” he says, but adds that it’s likely. The veteran reunions have tapered off. The last one he attended, in 2005, was written up in the Chicago Tribune; just a handful of men from his group showed up. “We had to put three squadrons together even to get enough men to qualify for a hotel discount,” he says. As he looks over the photographs carefully pasted into his cherished scrapbook, Pang runs a hand over the faces of never-forgotten friends. He has outlived many of them by more than half a century. War changes lives in an instant; it also lingers for a lifetime. This entry was posted on Wednesday, June 29th, 2016 at 12:00 pm	and is filed under Features, Top Posts. You can follow any responses to this entry through the RSS 2.0 feed. Both comments and pings are currently closed.